Cummings Veterinary Medicine | Buckle Up? Bad news: even if you buckle your dog into a safety harness before hitting the road, he’s probably not any safer than he would have been without the restraint. That’s the conclusion of the Center for Pet Safety, which recently tested four car restraints designed for dogs weighing 50 to 85 pounds. The center found that the restraints had a “100 percent failure rate,” with none deemed sufficient to protect a dog during a 30-mile-per-hour collision. 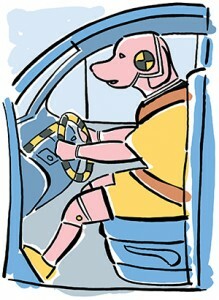 • The dog could choke or suffer other injuries when the harness cinches too tightly during a crash. The Center for Pet Safety since has teamed with Subaru to develop standards for canine safety harnesses that eventually will provide pet-product companies a clear benchmark for assessing safety. • Look for start-to-finish crash-test videos, often posted on the manufacturer’s website or YouTube. You want to be able to see the test in its entirety. • Ask the manufacturer what weight was used to simulate the dog. Many manufacturers use a 30- to 35-pound simulator, which does not guarantee the safety of heavier breeds, such as German shepherds and Labrador retrievers. • Ask the manufacturer what speed is represented during the crash test. Most tests are conducted well below highway speed—at 30 miles per hour, which is the speed at which the Center for Pet Safety conducted its own tests. Adapted with permission from Your Dog: The Newsletter for Caring Dog Owners, published by the Cummings School of Veterinary Medicine. For subscription information, visit tuftsyourdog.com or call 1.800.829.5116.